Common throughout at low and moderate elevations in shrubby habitats such as regenerating clearcuts and wetland edge. Particularly successful in highly altered landscapes of Puget Trough lowlands, including most of urban and suburban core where thrives in backyards and neighborhood parks. Follows low river valleys well into mountains (especially Greenwater, Green, Skykomish). 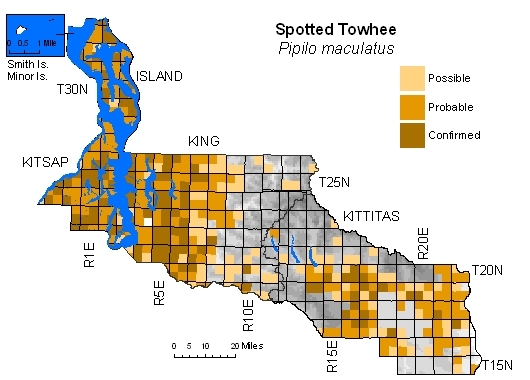 In Kittitas County, most common at moderate elevations in ponderosa pine belt and ponderosa pine/shrub-steppe ecotone, somewhat less common in riparian and irrigated habitats in steppe zone. 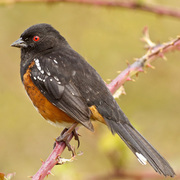 Scarce or absent at higher elevations on both sides of Cascade crest.